AEZs: Kenya System | Infonet Biovision Home. Agro-ecological zones (AEZs) are land units defined on the basis of combinations of soil, landform and climatic characteristics. Kenya has 5 agro-ecological zones. Agro-ecological Zoning (AEZ) refers to the division of an area of lend into smaller units, which have similar characteristics related to land suitability, potential production and environmental impact. An Agro-ecological Zone is a land resource mapping unit, defined in terms of climate, landform and soils, and/or land cover, and having a specific range of potentials and constraints for land use (FAO 1996). The essential elements in defining an agro-ecological zone are the growing period, temperature regime and soil mapping unit. Kenya has a total area of about 582'646 square kilometers of which 11'230 or about 1.9% is covered by water. The dry land mass is commonly divided into six agro-ecological zones as the table below indicates. From the above table virtually 80% of the country lies in the semi-arid to very arid Zones (ASALs), which are predominantly inhabited by the pastoralists and agro-pastoralists. The Kenya's ASALs also support about seven million people and more than 50% of the country's livestock population. These areas, which are also classified as rangelands, are unsuitable for rain fed cultivation due to physical limitations such as aridity and poor vegetation. This zone has no direct importance in agricultural production other than being the source of rain and some rivers/streams. It is confined to mountains and immediate surrounding such as Mt. Kenya and Mt Elgon. This zone is generally restricted to the highlands of Kenya between 1980 and 2700 m and occurs as a forest or open grasslands. This zone is found in the surrounding of Mt Kenya (parts of Meru, Embu, Kirinyaga and Nyeri), isolated parts of the Rift Valley around Mau and Aberdares mountains (e.g around Kericho and Nyahururu respectively) and the surrounding of Mt Elgon (e.g around Kitale and Webuye). The minimum rainfall is 1000 mm. The main grasses are Pennisetum clandistenum (Kikuyu grass), Themeda triandra (Red oats), Andropogon Chrysostachyus, Andropogon pralonsia, Exotheca abysinica, Digiteria scalaram, Eragrostis lascantha, Seteria sphacelata, Pennisetum catabasis and Sporobolus filipes. The legumes include Trifolium johnstoni, Medicago sativa (Alfalfa or Lucerne), Sesbania sesban and Leuceana leucusephala. This zone occurs mainly at elevations between 900-1800 m with annual rainfall between 950 and 1500 mm. Trees are numerous here and somewhat of shorter stature than in Zone II. This zone is the most significant for agricultural cultivation and several legume fodders are found here in crop-livestock systems. It is also the most resettled by human. It occurs in the vast parts of Nyanza, Western and Central provinces, good proportion of Central Rift-Valley (Nandi, Nakuru, Bomet, Eldoret, Kitale) and a small strip at the Coast province. The major grasses are Hyperenia and Cymbopogon, Themeeda triandra, Panicum maximum, Seteria Sphacelata, Sporobolus pyramidalis, Bracharia brizantha (Congo signal), Bricharia siluta, Chloris gayana (Rhodes grass) and Cynodon dactylon (Star grass). This zone occupies more or less the same elevation (900-1800 m) as the previous or may be at times lower. However, it has lower rainfall of about 500-1000 mm. This is typically represented in surroundings of Naivasha, vast parts of Laikipia and Machakos districts vast parts of central and southern Coast Province. It is the home of most Acacia trees and shrubs including Acacia seyal,Acasia Senegal,Acacia brevispica, Acacia drepanolobiumand Acacia gerrardii. Euphobia trees occur in some drier parts of this zone. Combretum and Terchonanthus spp. are also common here. Grasses found include Themeda triandra, Pennisetum mezianum, Pennisetum straminium, Pennisetum massaiense, Eragrostis spp., Hyperenia spp. Seteria spp., Digiteria spp., Bothriochloa insculpta, Cenchrus ciliaris. Rare grasses include Chloris spp. and Cynodon spp. Besides acacia, other important legumes include Indigoferra and Crotolaria. This zone is much drier than Zone IV and occurs at lower elevations. Annual rainfall is 300-600. 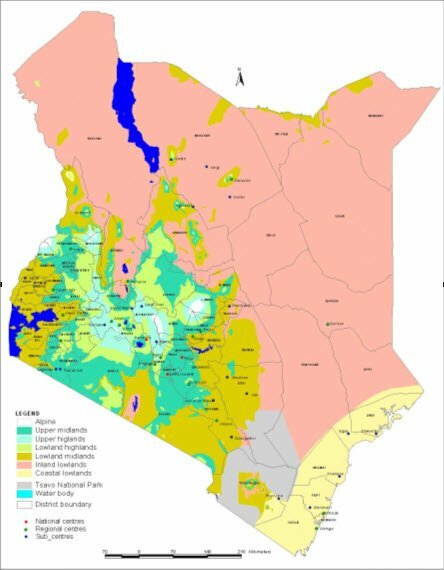 This Zone is prevalent in northern Baringo, Turkana, lower Makueni and vast parts of North Eastern Province. Low trees and shrubs found here include Acacia mellifera, Acacia tortilis, Acacia horrida, Acacia reficiens, Acacia nubica, Acaia paslii, Acacia Zanzibarica, Adansonia digitata, Terminalia prunioides, Dobea spp., Dioppspyros spp. and Commiphora spp. Common grasses are Eragrostis superba, Cenchrus ciliaris, Cymbopogon spp., Bothriochloa spp. and Heteropogon contortus. This zone is considered as semi desert and is the driest part of Kenya. Annual rainfall is 200-400 mm and is quite unreliable. 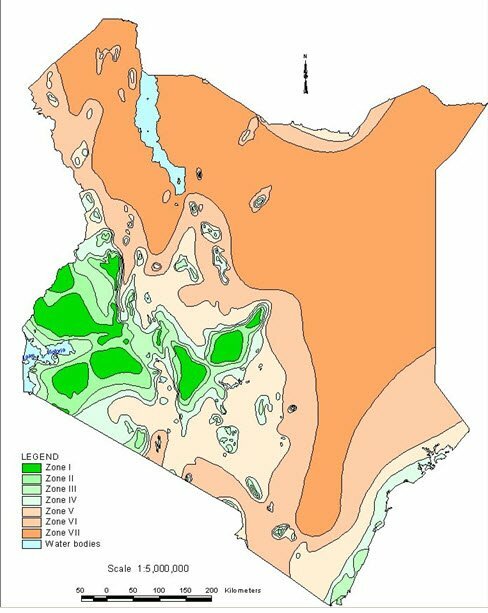 The zone is found in Marsabit, Turkana, Mandera and Wajir Districts. Dominant in this zone are Acacia and Commiphora shrubs with scattered taller trees of Delonix elata, Acacia tortilis and Adansonia digitata. Balanites eagyptica, Boscia coriacea, Salvadora persica, Acacia mellifera andAcacia reficiens are important shrubs or low tree species. The very common and important dwarf shrubs are Indigofera spinosa and Sansevieria spp. Other important shrubs are Sericocomopsis, Barberia and Duosperma eromophylum. Being the most delicate zone both annual and perennial grasses are important here. Important grasses include Aristida adoensis, Stipagrostis hirtigluma are very characteristic and may occur as annuals or perennials. Other grasses also found here are Aristida mutabilis, Chrysopogon aucheri, Tetrapogon spp, Enneapogon cenchroides, Chloris roxburghiana. This is represented by Chalbi desert in Marsabit district. The Chalbi is a salt desert with very sparse salt bushes as the only vegetation found. It is vast and of beautiful scenery. Pastoralists use it as a source of mineral lick for livestock, particularly during the rainy season.